Obama, however, may not have been aware of just how long her “impressive record” is. Shwartz’s sister and childhood friend both told The Jewish Standard that the 50-year-old judge always displayed a quick mind and an acute sense of fairness. “Patty was always very social, very smart and quick-witted, very respectful, and never mean-spirited,” said her older sister, Nancy Brown, an emergency room nurse at St. Joseph’s Medical Center in Paterson. A third sister passed away in 1997, and the family also includes two brothers. All the children helped out after school and on weekends at their parents’ fur and women’s clothing shop in Paterson. Their father, Harold (“Hesh”) Shwartz, inherited the business from his own father, who had founded it in 1905. Their mother, Jean, worked alongside her husband for 50 years until the shop closed when the elder Shwartz daughter died. It is no secret, however, that Shwartz grew up in an exceptionally close-knit Jewish family in Pompton Lakes. At her 2003 swearing-in ceremony as a magistrate judge on the United States District Court for the District of New Jersey, she expressed gratitude to her parents, who were still alive at the time. Both Brown and Warren County resident Michael Weiner, who went to Hebrew school with Shwartz at Congregation Beth Shalom in Pompton Lakes, were happy to shed some light on the personality of the woman nominated to serve on the second highest court in the United States. She described her sister as a devoted aunt to two nephews and two nieces. “Patty is the glue that holds everyone together. We see each other every weekend. She’s a wonderful human being,” said Brown. Shwartz was a cheerleader at Pompton Lakes High School. She received her B.A. from Rutgers University and was named the Outstanding Woman Law Graduate of her class at the University of Pennsylvania Law School, where she was editor of the Law Review. She worked as an associate at Pepper, Hamilton & Scheetz before serving as a law clerk to the Hon. Harold A. Ackerman of the United States District Court for New Jersey from 1987 to 1989. Shwartz then joined the U.S. Attorney’s Office for the District of New Jersey, where she prosecuted a wide range of criminal cases. 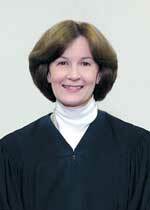 Since becoming a magistrate judge, she has handled more than 4,000 civil and criminal cases. She is quite active locally, especially with students. She frequently speaks with visiting school groups and participated at a Pompton Lakes High School career day, as well as a program at Golda Och Academy (formerly Solomon Schechter Day School) in West Orange. During the 2006-2007 school year, she was a workplace mentor to a senior at Bergen Academies in Hackensack. She also teaches an evening skills course as an adjunct professor at Fordham University School of Law. The next step in her nomination process is to appear before a Senate Judiciary Committee panel sometime in January.